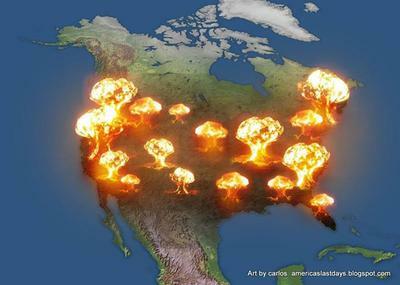 I was shown the utter and complete destruction of Americs by nuclear attack. Everything you write about is true...I saw it in heaven from God's perspective. May He help us all! Reply from Watchman Bob: I'm thankful for your input, Ariela. I don't see it as a nuclear attack, but as the impact of a comet fragment, or one exploding over North America. But the appearance and the results of a commetary explosion are exactly the same as those of a nuclear explosion, so we could be seeing the same thing. Either way, Scripture seems to clearly teach that America will be annihilated in the very near future. And, when that happens, the whole world will be thrown into chaos. So let's all be looking up, from where our Redemption will soon come (Luke 21:28).